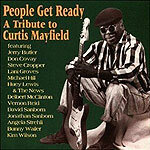 CD review: "People Get Ready: A Tribute to Curtis Mayfield"
This review first appeared in the August 6, 1993 issue of the North County Blade-Citizen (now North County Times). Classic R&B composer/performer Curtis Mayfield was recently paralyzed by a freak accident (a piece of stage equipment was blown into the singer during an outdoor show). To help offset his medical bills, a broad group of admirers has put together a collection of some of his best songs. From Delbert McClinton's Texas blues version of "He Will Break Your Heart" to Angela Strehli's soulful "Got a Right to Cry" to the doo-wop stylings of Huey Lewis & the News on a cover of "It's Alright," this album crackles with great music dedicated to a great cause.